Ana Sagar Lake is a man made lake that was constructed in the reign of King Anaji (1135 AD -1150 AD), the grandfather of Prithvi Raj Chauhan. He made the lake for the betterment of his subjects. 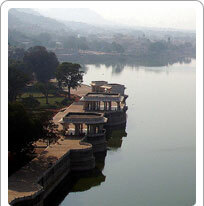 A picturesque excursion destination, Ana Sagar Lake has facility for boating. This lake is considered to be the largest in India. The lake's embankment is built between two hillocks-Bajrang Garh and Khobra Bherun that have Hindu temples of the same names built on them. Emperor Jehangir added the Daulat Bagh gardens near the lake and Emperor Shah Jahan of Taj Mahal fame added the Baradari, a marble pavilion.